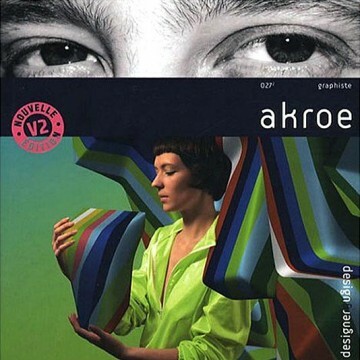 Design & Designer 027 v.2 – Akroe, official blurb: Akroe is still one of the most prolific players on the French graphics scene. Though continuing his work for electronic-music labels and clothing brands, he is now extending his reach to other spheres. He recently illuminated the window displays of Galeries Lafayette department stores, illustrated pages in Japanese Vogue, and decorated a ceiling of the Printemps’ flagship store in Paris. He also created the very elegant poster for Céline Sciamma’s debut film, Naissance des pieuvres (Water Lilies).